I’ve been wanting to do the Mullyangiri – Bababudangiri trek since I heard about this scenic route. I had initially planned to do this in mid-late November with some friends. However, as best laid plans go, this one kind of unravelled as the date drew near. 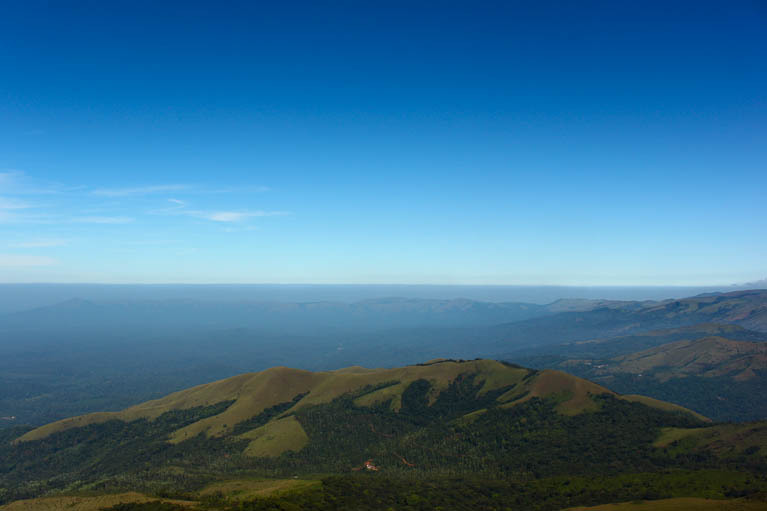 However, when I learned that Bangalore Ascenders would be also attempting the trail (with the added incentive of trekking all the way to Kemmangundi), I quickly signed up for the trek. The weekend before the trek was spent in getting the necessary supplies (food, sleeping mats etc.) as I didn’t want to leave anything to the last minute. We had planned to leave on Friday night and reach Chikmaglur by early morning on Saturday. By Wednesday we had all received details on the pick-up points. As planned I reached my pickup spot at Domlur at about 10:15 in the night. I met up with one of the participants, Omendra there. We spent quite some time waiting there as the Tempo Traveler was delayed. At long last, the much awaited TT arrived and we got in. We started moving to the next pick up point near Majestic and picked up the tents along the way. Finally the rest of the team boarded at Majestic and we started on what would prove to be an adventure of epic proportions. We awoke on Saturday to find ourselves at Chikmagalur. After freshening up at the bus stand, we then went on to have a sumptuous breakfast and pack some Pulav for lunch. After Breakfast we boarded the TT and went on to the start of the trail. Since the TT could go to the camping site, we just needed to take some snacks and water along. Once again the lightweight daypack that I bought turned out to be quite handy. Pretty soon we had all picked up our day packs and were ready. The TT left for the camp site and we were ready to start the trek. First we had a quick round of introductions. There were 13 of us in all: Ranjan, Muthukumar, Kiran, me, Tanoy, Karan, Nagarjuna, Praveen, Ganesh, Deepak, Omendra, Bharath and Girish. I had previously trekked with Girish and Muthu on the Kudremukh trek and with Karan on the leech ridden Kumara Parvatha trek. Also Deepak was a colleague of mine from work. The rest of the people were new faces to me and overall it was a pretty diverse group. After introductions we began climbing up the trail. That’s when someone realized that for some reason Muthu’s daypack as well as the main backpack were out on the road. Eventually, Girish agreed to pick up the main bag and carry it along. Our first destination was Mullyangiri. Mullyangiri which is 1930m tall is the highest peak in Karnatka. The trail that we took up was one with a slightly steep ascent, where we needed to climb up for about 2 hours to reach the top. The journey up was quick and we didn’t take too many breaks on the way up. Along the way up we were treated to beautiful views of the valley below and the surrounding hills. We also spotted some raptors (falcons) and were treated to their aerial acrobatics as they hovered in mid-air before diving down to snare their prey. After about 2 hours we were almost at the top. Just as we were reaching the top, Deepak had a minor stumble. While he was alright, we definitely didn’t waste time pulling his leg about the minor “earthquake” that we had just witnessed. Just before the Mullyangiri peak, there is small cave structure and a bunch of us ventured into the caves to explore. The cave exploration party returned with interesting tales to tell of the almost 1km long cave, including those of spotting bats in the caves. In another 10 minutes or so we reached the top of the peak. At the top of the peak there is a small temple. We spent some time exploring the temple and seeing the views from the temple. After we were done with our exploration we began our onwards to journey towards Galikere which was to be our camping spot. This trail was more of a ridge walk that involved climbing and descending a few hills. We initially lost the trail a bit, but some quick back tracking had us back on the path in no time. The next few hours were spent walking along a beautiful trail that weaved over some jaw-dropping landscapes. After some time we began descending towards a road that we needed to cross. Just before the road we found a film unit shooting some scenes from a movie. We spent some time at the shoot, with Girish taking pictures of the lead actress – “Neetu”. We then started on the trail again. Before ascending, we stopped at an abandoned house to have our lunch. The pulav tasted delicious after our long hike to this spot. Nagarjuna had also bought along some chappatis and pickle that he shared. After we had filled our stomachs we started back on the trail. The trail once again began ascending and after a somewhat precarious climb we finally reached the final ridge that we needed to climb onto. At the top of this mountain was an abandoned BSNL tower, which was one of the landmarks on our trail. After resting here for some time we finished the remaining of the trail and reached Manikyadhara Falls which marked the end of the day’s trekking. All of us were famished by then and we attacked one of the local food stalls. In no time plates upon plates of bread-omelette and parathas were devoured followed by some tea and coffee. By this time our TT had also come and after finishing our snack (and soon to be dinner) we began our journey to our camp site. We had decided to camp at Galikere which was about 7km from Manikyadhara Falls. We reached there just as the sun was beginning to set. After somehow reversing the TT on the narrow precarious road we started unloading the camping gear to set up camp. Galikere is actually a small heart-ish shaped lake on top of a hill with some flat area near the lake where one can set up camp. Apparently Gali-kere means “Windy-Lake” in Kannada, and we soon found out how apt this description was. We had a few T-2 tents and a T-3 tents which would be enough to house all of us for the night. We quickly set up the tents. Since it was very calm, Girish was of the opinion that we wouldn’t need to weigh down the tents. So we just weighed down the larger tent and moved to the campfire spot where Bharath had gathered some twigs and branches to set up a small campfire. By now it was becoming dark and quite cold. Already the night sky was lit up with thousands of stars and one could clearly see the Milky Way. Of late I have been obsessed with shooting the night sky, and I thought I’d take this opportunity. I set up my tripod and began taking some test shots. After a little tinkering, I managed to get one halfway-decent shot. Pretty sure that I had nailed the technical aspects of the shot, I packed away the tripod thinking I’d finish shooting after dinner and joined the rest of the people round the campfire. A lively session of introductions was on, and we had a wonderful time pulling each other’s legs in a nice session of bonhomie and camaraderie around the camp fire. After the fire had died down, we started preparing soup on the small stove that we had bought along. One of the guys got some water from the lake and we started boiling it. I had decided I’d have a pack of ready to eat cup noodles for dinner and was waiting with for the water to boil. The water was taking too long to boil so we thought of putting it over the embers of the fire and adding some more fuel to it. We moved the utensil to the campfire. After a little while the water had boiled and I added some to my noodle cup. That’s when all hell broke loose. Suddenly the wind picked up and started blowing like crazy. So we huddled round the fire to keep it burning. That’s when someone noticed that the tents had started to become balloons and fly in the wind. With that started a mad scramble to weigh down the tents and keep them attached to the ground. We first put in all the bags into the tents, and weighed down the tents with rocks. When even that didn’t help, we just got into the tents!! I had hoped that the wind would stop blowing after some time, but it didn’t. Thanks to the wonderful weather, I had to scrap my plans of shooting the night sky. We spent the rest of the night listening to the wind howling outside the tent, wondering whether the tent will fly away or collapse on us. The next day we woke up to the howling wind outside. It still hadn’t stopped blowing. In fact the wind was so fierce that we had difficulty moving around freely. A small mis-step and the wind would blow you away with it. After struggling with the wind, we finally managed to freshen up and wrap up the camp. Taking the tents etc back to the TT we realized to our surprise that it was absolutely calm near the TT !!! Once again, we just needed to carry some food and water for the remainder of our journey and left most of our luggage in the TT which then made it’s way to Kemmangundi. We then started on the trail to Kemmangundi. The trail to Kemmangundi from Galikere is about 16-17 km in length and it passes over several small hills before descending from Kemmangundi through a coffee estate and passing by Kallathi Falls. This trail is not frequented that often by trekkers and the trail sometimes vanishes. Thankfully, Girish had the entire trail mapped on his phone. Armed with this info we started on the trail. The trail as usual was extremely scenic, more so with views of the forests in the valley below. As we trekked we came across several groups of Sambhar running on the hills. We also found some porcupine quills and an antler of a deer. After some time we stopped in a small clearing in the forest and heated some water from a nearby stream to cook our breakfast of cup noodles. Having done with the breakfast, we started again on the trail. By now it was fast approaching mid-day and it seemed that we had not made much progress. Thankfully the sun was not that sharp and the cool mountain air and breeze made trekking very enjoyable. In our endeavour to finish the trail, we took quite a few shortcuts down some steep hills and thick forests. After much walking we finally spotted some signs of civilization. We passed some houses where we met some folks who told us to quickly finish the trail as this was a reserve forest and we were not supposed to be there. We crossed the houses and began our steep descent to the coffee plantation. After some time we had reached the bottom of the hill and began the descent into the coffee plantation. We crossed several small streams and waterfalls along the way before finally reaching Kallathi waterfalls and exiting out of the coffee estate. After having a quick dip at the waterfalls we started back for Bangalore. On the way we had an excellent dinner at a dhabha. We finally reached Bangalore at about 4 the next morning ending a wonderful adventure made memorable by some great company. 2) Where is this reserve forest? Before Kemmagudi along the ride? Thanks for this detailed narration of this trek. My name is Gokul resident of Bangalore. I am also a member of BASC. I wanted to do the part of this trail (Bababudangiri to Kallahati Falls) but I am out of Information. Please help me out with this. My email ID is rahulwitu@gmail.com.